Opening with a textual title card, pointing out that over 40,000 acres of Texas woodlands burnt down inexplicably in the mid-'80s, David Gordon Green's decidedly dramatic and contemplativeâ"yet still occasionally absurdistâ"character piece, Prince Avalanche sets up a thematic template of man's relationship with nature. 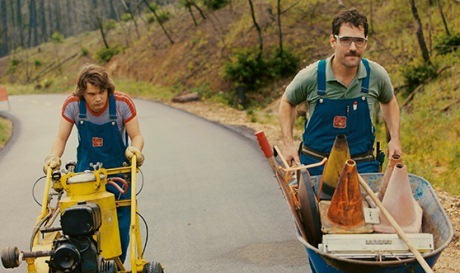 Alvin (Paul Rudd) and Lance (Emile Hirsch) work along an isolated rural highway, painting on lines and hammering reflective markers into the dirt shoulders. Alone for weeks at a time, Alvin and Lance are forced to bond over trivialities and observe the most embarrassing and unflattering attributes in each other. Where Alvin sees the solitude as an academic exercise of sorts, taking the opportunity to learn German and catch up on his reading, Lance finds the quiet frustrating and boring, talking mostly about his next chance at getting laid. They already have a central bond, with Alvin dating Lance's older sister, but their odd couple dynamic represents either end of the social spectrum, suggesting that the motivations for wanting constant companionship (like Lance) is not entirely dissimilar to the need for quiet (like Alvin). Lance's need for constant distractions and diversions is, in a sense, a way of avoiding introspection, whereas Alvin's avoidance of social situations is a way of avoiding the introspection attributed to being different. What's interesting about Green's deliberately paced, often tangential, existential yarn about loss, repetition and, eventually, social rebellion and anarchic principle as a means to discovering the true self, is that it avoids exploiting comedy. Lance routinely says ignorant things and Alvin occasionally dances by himself in the river, but these moments are handled with the same stoic gravity as every other plot point in the film. Even an elderly drunk that comes along every once in a while to give Alvin and Lance booze, telling them what a great job they're doing, exists as a presumed comic sidebar that ultimately becomes just another facet of the central themes of loss, avoidance and social order as invading and dividing force. Moreover, Green often takes extended breaks from the narrative to focus on images of nature in relation to the habitual routine aspects of human life with only a musical score doing the talking. It's a very calculated way of asserting worldly values and forced introspection onto an audience expecting the sort of standard comedy that Paul Rudd and David Gordon Green are known for. It's true that the assertions about destructive forcesâ"like fireâ"stripping away the forced, presentation-based, identities we all assume is quite glib and overly simplified. But there is something about Prince Avalanche that allows for deeper, personal interpretation about friendships and the many signifiers we establish to judge and shut each other out.